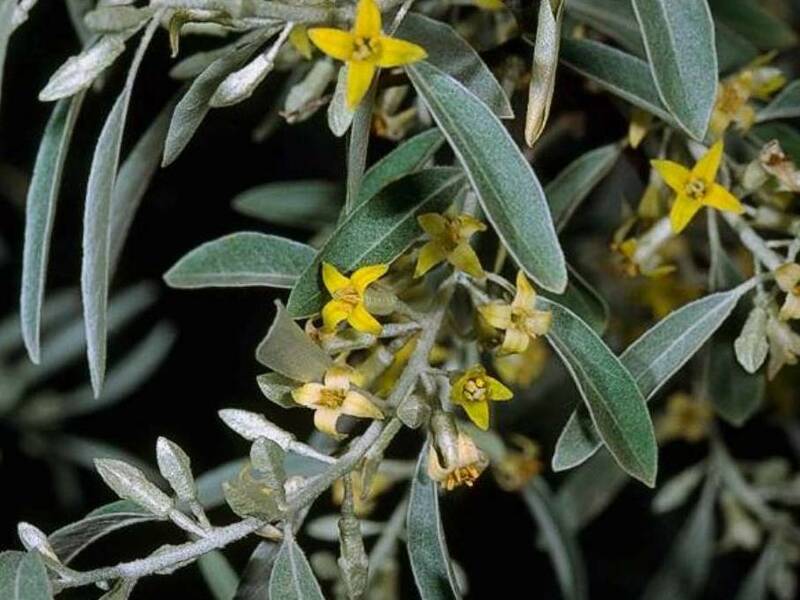 Elaeagnus angustifolia (Russian-olive) grows as a tree or shrub (family Elaeagnaceae) and is found in disturbed, seasonally moist places, generally below 5,000 feet (1500 m) elevation. It occurs in the San Joaquin Valley, San Francisco Bay Area, southern Sierra Nevada, San Diego County, and parts of the Mojave Desert near springs where it crowds out native species. It is able to regenerate under a wide variety of floodplain conditions with little or no mortality after seedling development. Native cottonwoods and willows, having narrow germination and establishment requirements and intolerant of shade, are unable to regenerate under advancing populations of Russian-olive.